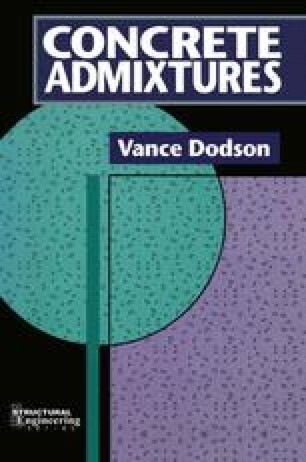 The author has chosen to discuss water reducing admixtures (WRAs) first because their volume of use in concrete is the largest of the chemical admixtures . This class of chemical admixtures permits the use of less water to obtain the same slump (a measure of consistency or workability), or the attainment of a higher slump, at a given water content, or the use of less portland cement to realize the same compressive strength. Their effects on the physical properties are specified in ASTM C494 . The theoretical water-cement ratio ranges from 0.27 to 0.32, depending upon the composition of the portland cement and the individual doing the theoretical calculations. The amount of water in excess of this ratio is often called “water of convenience,” in that it makes it more convenient to mix, transport, place, and finish the concrete.